Wanna run for President? VoteMe is a new game for the iPhone, and iPod Touch developed by Bamboo Apps. The VoteMe application is pretty unique and something I have not seen before. With this app, you can sign up as a social candidate and form a party of people who think and feel the same way as you do. You can create a very detailed campaign with a lot of different tools. The point of this app is to be able to broadcast your feelings about different political ideas, and of course to have some fun. This iPhone app is very interesting, as it allows you to change pretty much everything and anything about your campaign as you see fit. You gain points by getting friends from either Facebook or within VoteMe to join your campaign. Some people decide to take it seriously and become the first social president, while others are just in it for the fun. The concept of VoteMe is new, exciting, and unique. It’s not something I’ve seen before which is appealing. It allows you to make your own political campaign, and who hasn’t wanted to do that at least once before in their life? The strengths of VoteMe is it’s flexibility and customization options. It allows you to change every little detail about your campaign, making it extremely fun to do. Also, the interface is very straightforward, and nice looking. It won’t take you long to figure out everything you need to know about VoteMe, as everything is labeled clearly. VoteMe is very easy to use on the iPod touch and as an iPhone app. The interface is very nice and clean, and looks great. Everything is labeled properly and descriptively, so there is no problems finding what you are looking for, whether it be to invite more friends, add photos, or see your statistics. The value of VoteMe is amazing, this application is worth money, just because of how much fun it is, and how well put together it is. VoteMe is very high quality. The reusability for VoteMe is unlimited, there is so much potential with VoteMe it is unreal. You can launch as many campaigns are you want, you can follow whatever campaigns you feel like, and you can laugh at the campaigns your friends and family make. 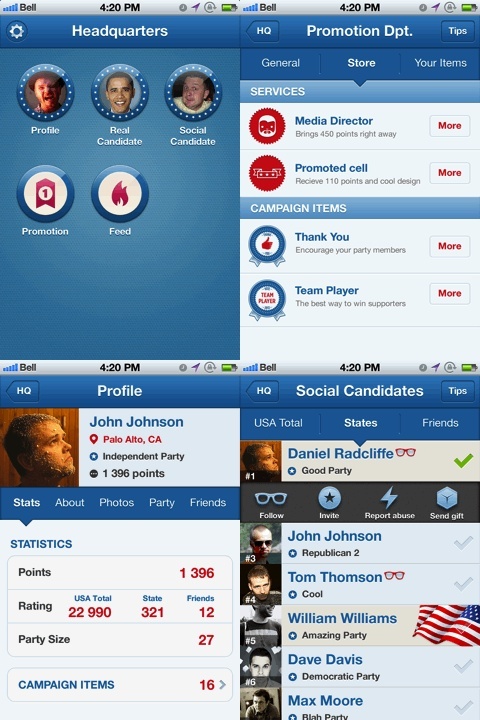 Overall, VoteMe is a fresh concept in iPhone social gaming involving politics, so get it as soon as you can. It is a blast to use, and it is very fun to get your campaign up and running. AppSafari review of VoteMe was written by Darius Reimm on February 16th, 2012 and categorized under App Store, Free, Fun, Social. Page viewed 3316 times, 2 so far today. Need help on using these apps? Please read the Help Page.